Is your language limiting your joy and discrediting your leadership? Video: What Do You Mean, You’re Too Busy to Innovate?! "Be" about it. Secrets for making your year, and your impact, right. Want to add zero's to your business? Smiles to your peeps? Add Love to your leadership. Environmental Success: What closets & CEOs have in common. Do "they" live in your organization? Mastering the mysterious "They"
Want it? Get it. Love it. Be it. Leadership in the trenches. when you think you have to work harder...you're probably wrong. Lead/"Beek"/Run - Love, kindness & bringing it "all" to the "mat"
Grateful or Entitled...How do you respond to an acknowledgement? Leadership in a Minute: Get Back Up! 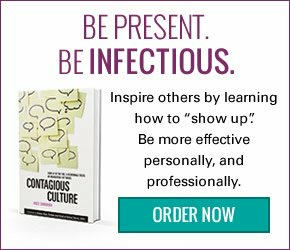 Leadership in a Minute: Who’s Surrounding You? Leadership in a Minute: Learn to "fill"
Confessions of a “swimmer”…Where do you focus your attention? Got Energy? Lead With It. Tis that time of the year again...Think about it. Are you ready for 2010? What are you thinking? Environment, Joy & Leadership…Are Yours In Sync? Get in front of "stress"... create "balance"
Boots, 12 Hugs, Cupcakes & Leadership??? Dare to laugh in the face of “work/life” balance..Want it? Define it…. Dare to Stay On Your Edge – Grow! Dare to Stay Engaged Through Extreme Self-Care! Dare to Shift Your Mindset – Appreciate! Dare to Expand – Stop Resisting! Dare to Ask the Hard Questions – Look Inside! Dare to Step Ahead – Plan! Dare to Change – Changes at DTE! Are you a "Talker" or a "Do-Er"? Business Coaching Tip: Dare to be PRESENT - or what's the point? Work/life Balance: How Personally Sustainable are You?